If you happened to find yourself traveling through Europe, you probably wouldn’t be that surprised to come across an old castle. 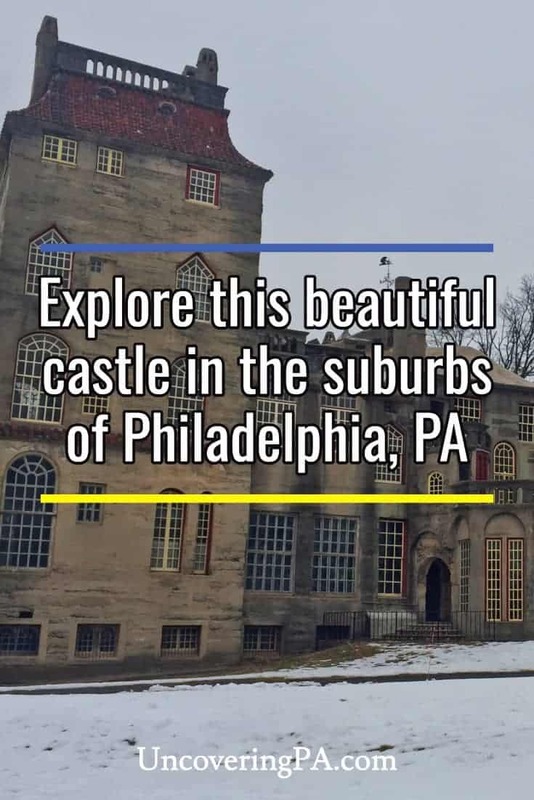 However, a castle in the countryside of Philadelphia is another story. 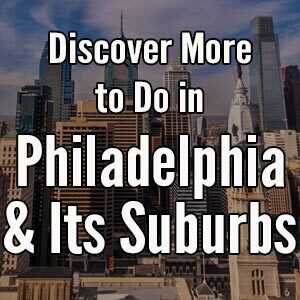 In Doylestown, the county seat of Bucks County, that’s what you’ll find. In fact, there are three castle-like structures in the town, all built by the interesting and eccentric Henry Chapman Mercer. 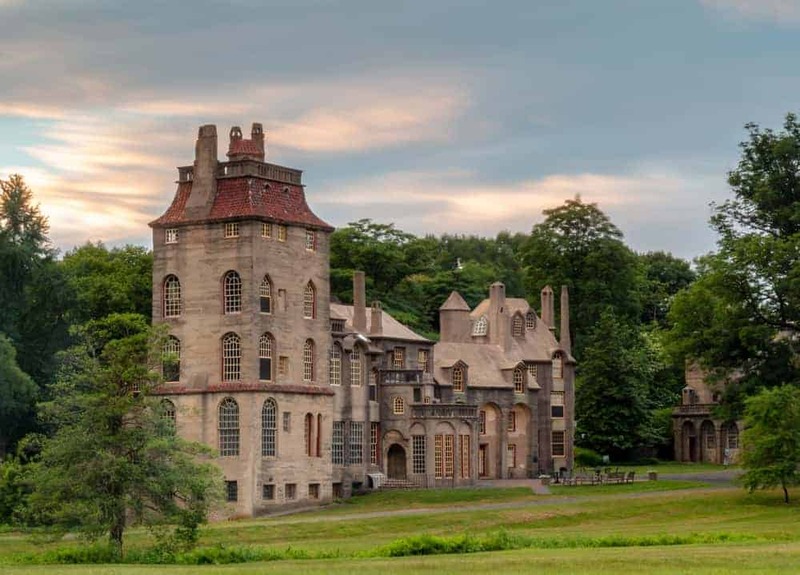 Of the three buildings that Mercer built, none were as personal as his home, Fonthill Castle. 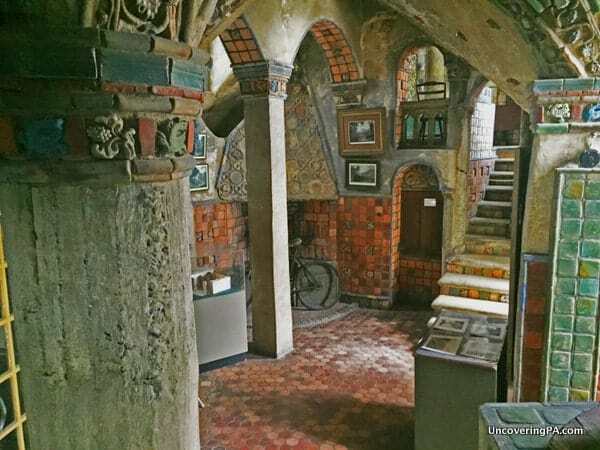 Built between 1908 and 1910 by 10 unskilled craftsmen and one horse, Mercer’s vision was created using hand-mixed concrete and a trial-and-error method that somehow didn’t fail miserably. A side view of Fonthill at sunset. Mercer lived in the castle from 1910 until his death in 1930. Dying without heirs, he put his home in a trust as a museum, with the condition that his housekeeper and his assistant, Laura and Frank Swain, be allowed to stay in the home until their deaths. After Laura Swain died in 1975, the home was opened as a museum the following year. 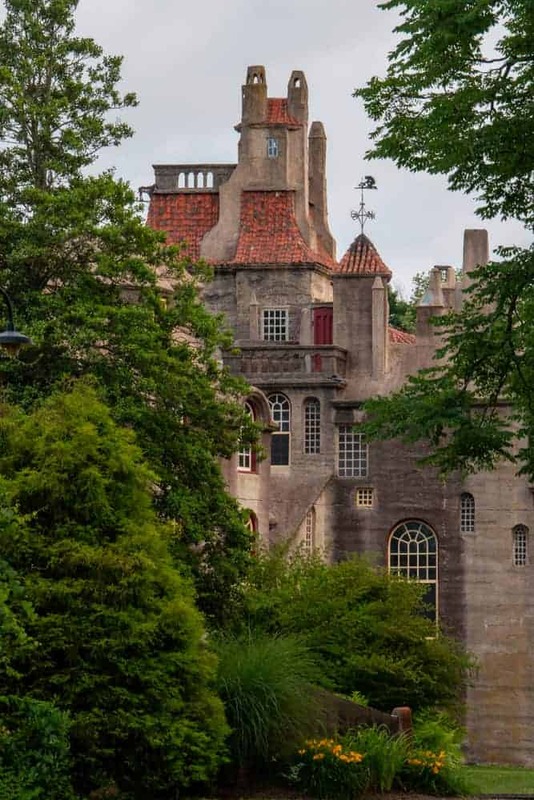 Mercer called Fonthill a “Castle for the New World,” and walking up to the home, it’s not hard to imagine it fitting in well amongst the many castles of Europe. The home’s large size and towering concrete walls make this one of the most impressive home exteriors I’ve come across anywhere in America. But the impressiveness doesn’t stop outside. In fact, the interior is just as fascinating, if not more so, than the outside of the home. Mural decorations along the ceiling with several of Mercer’s favorite pictures inside of his office. From the second you step through the front door, you can tell that this home is something special, despite this area being occupied by the home’s gift shop. Visits to the home are by guided tour only, so, if you have to wait a bit, take a few minutes to browse the gift shop and check out the unique architecture and design that you’ll find throughout the castle. There is also a brief video you can watch on the home, but since most of the information was covered during the tour, I wouldn’t worry too much if you don’t have the chance to see the video. My tour started in the home’s library, with a brief overview of Mercer’s life and the history of the home. All around the home, you’ll encounter thousands of books, all of which were both read and heavily notated by Mercer himself. The library is an excellent place to start the tour because it is a great example of the style that continues throughout the home. 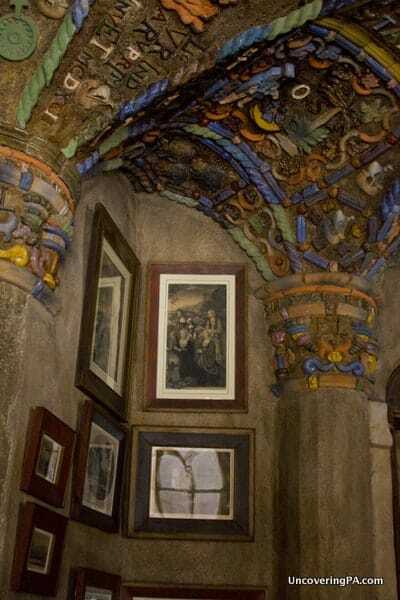 The interior artwork and architecture of Fonthill Castle is like nothing you’ve ever seen before. The tour continued into the saloon. I was a bit disappointed to find out that this was simply a meeting room and not a fancy bar, but it was still a very cool room. As the largest room in the home, Mercer would often entertain guests here, and displayed many of his prized artifacts. In the late 19th century, Mercer spent considerable time in Europe. 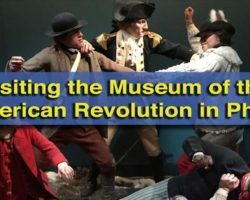 During his travels, he collected many artifacts, some of which made their way to the Penn Museum in downtown Philadelphia, where he was a curator for a few years. However, he also brought many tiles back to America, which he displayed in the walls of his home, even going so far as to label what they were using tiles from his factory. 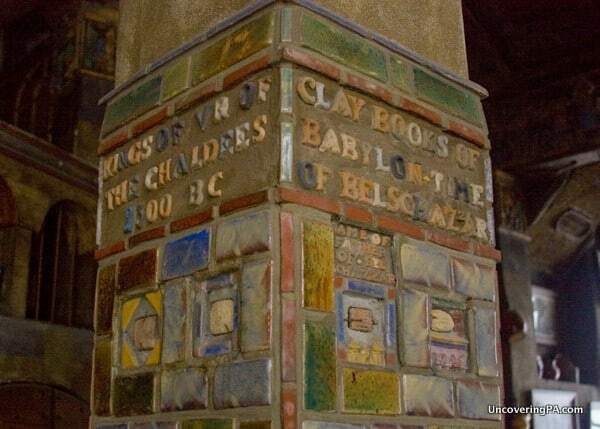 A column full of Babylonian tiles, with Mercer’s labeling tiles at the top. These tiles range from 18th century European tiles all the way back to Babylonian tiles from 2300 B.C., all built right into the home’s walls, ensuring that Fonthill will always be a remarkable museum. The tour of the home continued through many of the home’s rooms, with brief stops in several bedrooms, bathrooms, Mercer’s office (which was arranged with workstations in several places to capture optimal light during the day), and the room that he died in. What I really loved about Fonthill, in addition to the European castle-vibe, was all the beautiful tiles scattered throughout the home. Thousands of them were scattered in the walls, floors, and columns of the homes. Some of them were simple decorative colors, while others were mosaics or even told stories through multiple tiles placed next to each other. I have no doubt that you could tour the home a hundred times and still uncover a new one that you had never seen before. All told, the hour-long tour was very informative, but I wish I could have seen even more of the Fonthill Castle’s 44 rooms. 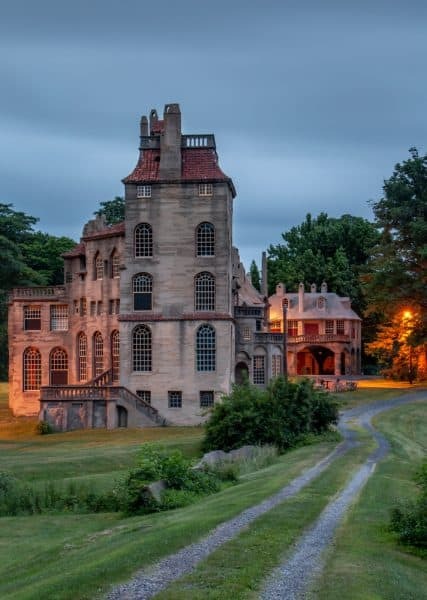 From time to time, Fonthill offers an in-depth tour that includes access to nearly ever room in the home, including the top of the home’s tower, where Mercer once lit a fire to prove his home couldn’t burn down (the reason he used concrete for his buildings). I would love to visit again for this tour to see even more of this beautiful home. 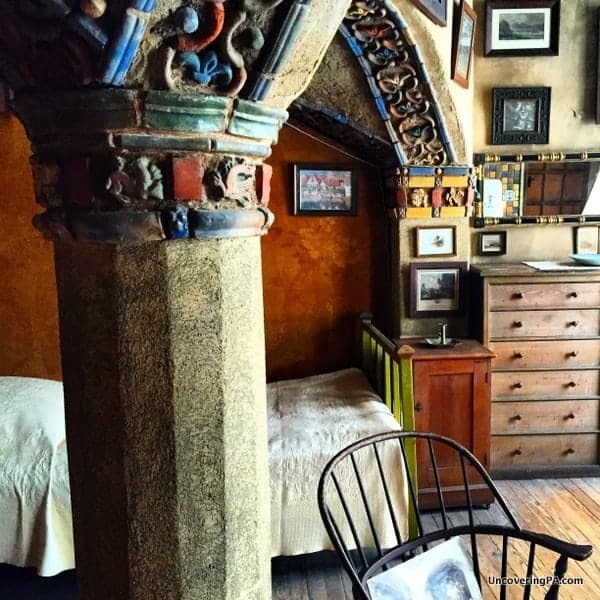 Henry Chapman Mercer’s bedroom inside of Fonthill Castle. Ultimately, I wholeheartedly recommend a visit to Fonthill Castle in Doylestown. 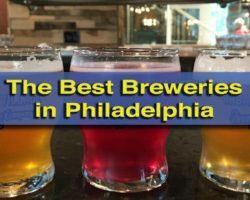 If you have any interest in art, history, architecture, or just quirky attractions, Fonthill (along with the nearby Mercer Museum and Moravian Pottery and Tile Works) is worth the trip from downtown Philadelphia. Note: My visit to Fonthill Castle was hosted by Visit Bucks County. However, the opinions expressed are my own. Love your post. 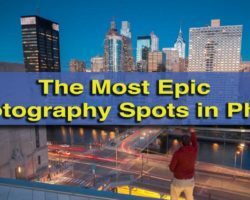 Very nice article and I will definitely going to see this place. 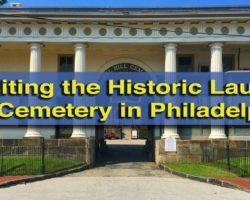 My wife and I love finding historic places to see especially close to home and in Pennsylvania.